Excessive hair growth, it can be found smooth hair in woman thicker and darker. The hair growth is more excessive on the back buttocks, face or chest. Oily or acne scene on woman face. Depression and anxiety feeling. These feelings are common in PCOS suffer. Difficulty getting pregnant. Most of the woman with PCOS have difficulty conceiving (infertility). Hair loss or thinning head, or thinning head, or baldness with androgenic alopecia. Irregular menstruation. Some woman with PCOS also may not experience menstrual periods, and others probably cause severe bleeding. Polycystic ovaries are larger, and there are small fluid sacs that surround the ovarium. Changing lifestyle. The patient can start with a healthy diet to lose weight. The smoker lover must stop. Because cigarettes may affect to higher level Androgen Hormonal than nom-smoker. Change your schedule to make a small surgery. A minor surgery called Laparoscopic Ovarian Drilling (LOD) becomes an option to deal with PCOS-included fertility problems. Do hormone therapy as soon as possible. This therapy can help you to get pregnancy. Besides that, it is useful to normalize the period cycle, prevent uterine cancer, excessive hair growth, the appearance of acne, and decrease hair loss. Hair loss causes baldness faster in women hair. It is like Corona lost from your hair. 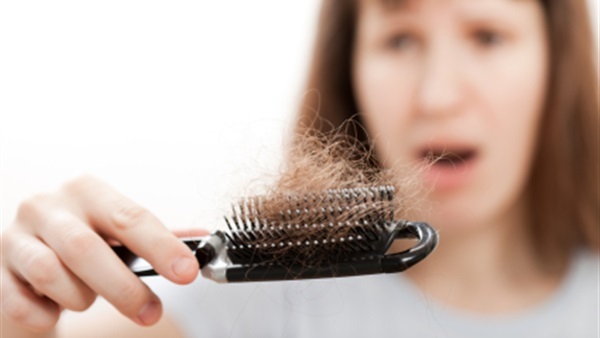 If you are confident in hair loss, well there will be a not big problem to deal with PCOS. If you are a true woman, you can control this issue yourself. As I said before, the level of hormone Androgen will increase in a patient with PCOS disorder. This hormone should not be produced in higher scale in a woman. Of course, this hormone is produced by both sexes (men and women). The high levels of Androgen can be a major factor causing hair loss (Androgenic Alopecia). Avoid using head coverings such as hats, helmets for a longer time. If you are in open air area, you are required to have Personal Protective Equipment. Do not change shampoos, conditioners, hair gel, hair oil, and other. Make sure the shampoo suitable for your hair condition and scalp. Find some tips to prevent dandruff. Dandruff can cause the scalp dry and crusty which is ultimately inhibits the nutrients for hair follicles. Dry your hair after shampooing to prevent the fungal infection, however, minimize the use of blowers. But a hair blower can cause broken hair, branched, and fall. Consume the food to minimize hair loss. Lack of the nutritional intake can cause hair loss. Eat the macro nutrients for your body (protein, fat, and carbohydrate) and micro nutrient food (vitamins and minerals). Prevent water hydrate in your body. You should drink plenty of water. Reduce stress. Stress can cause hair loss. So, to maintain healthy hair, avoid factor that can trigger stress. Regular exercise plays important rule to make your hormone balance. Using natural material for hair is recommended. The use of natural oils is good for hair loss such as aloe vera, olive oil, green tea, lavender oil, many things else. So, PCOS can change hormonal problem in a woman. It is called Androgenic Alopecia. However, the hair loss should be treated well, and keep in mind that most of these methods are not clinically tested, so there is no possibility of success. If you would not try this advice, you can consult your doctor, if you are in doubt about natural remedies.